I'm back from vacation and slowly getting back up to speed, so it's a good time to check in on what's going on with our trusty robots around the solar system. Before I do that I want to give a big thanks to Jim and James for their contributions. If you want to give them any feedback I'll be happy to forward your messages! I'll have more of a Phoenix update tomorrow, but I'll mention briefly that there was a press briefing today in which they said the TEGA oven was working great, having done two heating cycles, but that they haven't seen any water yet -- which was as they expected, because the sample they were working with had been exposed to sun and atmosphere for days before its analysis. They're done working (for now) at the Dodo-Goldilocks site, and will now be turning to a site at the opposite (right-hand) end of the work volume "National Park," which is called Wonderland. Wonderland is in the middle of a polygon, whereas Dodo-Goldilocks was on the edge of one. As I mentioned before, I highly recommend keeping up with the mission by visiting the Texas A&M website with the raw images from the SSI camera. Because of Mark's site I will no longer be updating my own raw images page with the mast-mounted SSI camera images but since Mark's page doesn't have the robotic arm camera images I may get back to updating those. I'd do microscope images too but none of them have shown up on the Phoenix raw images site since sol 4.. 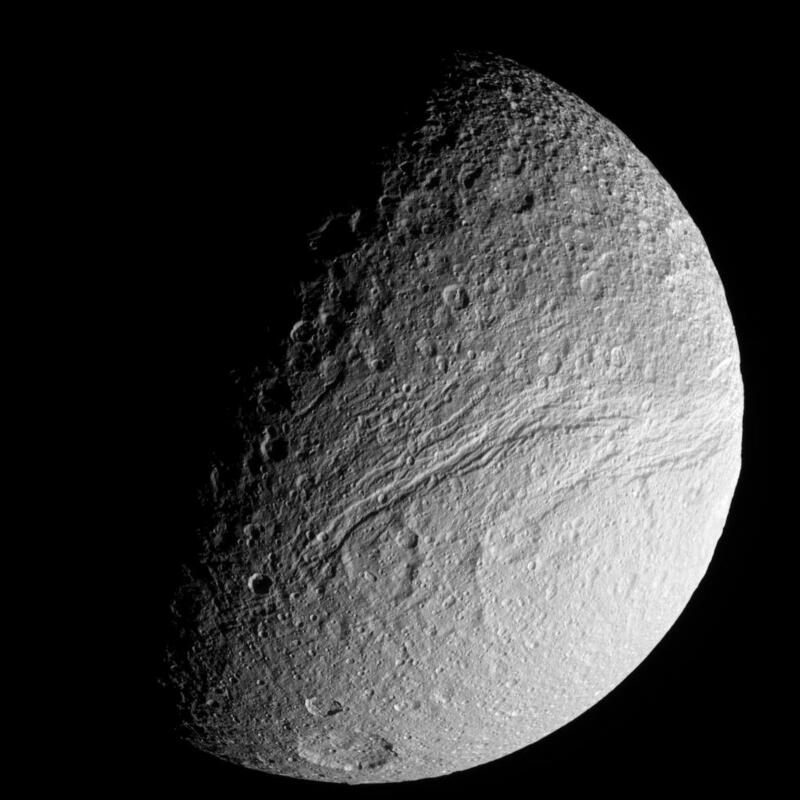 In a view onto Tethys' south pole taken by Cassini on May 10, 2008, the southern end of the moon-wide canyon system of Ithaca Chasma splits into imbricated trenches. The direction of lighting makes the huge impact basin of Telemus almost invisible on the lower right sunlit portion of the disk. We're in the middle of a stable few weeks on the Cassini mission. It has just passed periapsis (closest approach) on rev 72 around Saturn, crossing to the southern, sunlit side of the rings at almost the same time. The orbits are now almost exactly a week long, with periapsis happening on Mondays and apoapsis on Thursdays; and as 7 days divides poorly into 16 days (the length of Titan's orbital period) there's not going to be another close Titan flyby and corresponding change to the orbit for quite some time, until July 31. There are distant looks, though, affording good views on moons, like the photo of Tethys at right. On the surface of Mars, it is late autumn in the southern hemisphere (Ls 86°), sol 1,583-4 for Spirit and sol 1,562-3 for Opportunity. Spirit is still parked on the edge of Home Plate, in the same position it has occupied since sol 1,464 (February 15), with its solar cells pointed northward toward the winter sun. Opportunity is now driving again, so I'm posting a new route map, below. The rover seems to be on its zigzaggy way toward Cape Verde. Below, a shot from the Navcam shows the driving position for the arm (at least I think it's the driving position), which can no longer be stowed due to the failure of its shoulder azimuth joint. 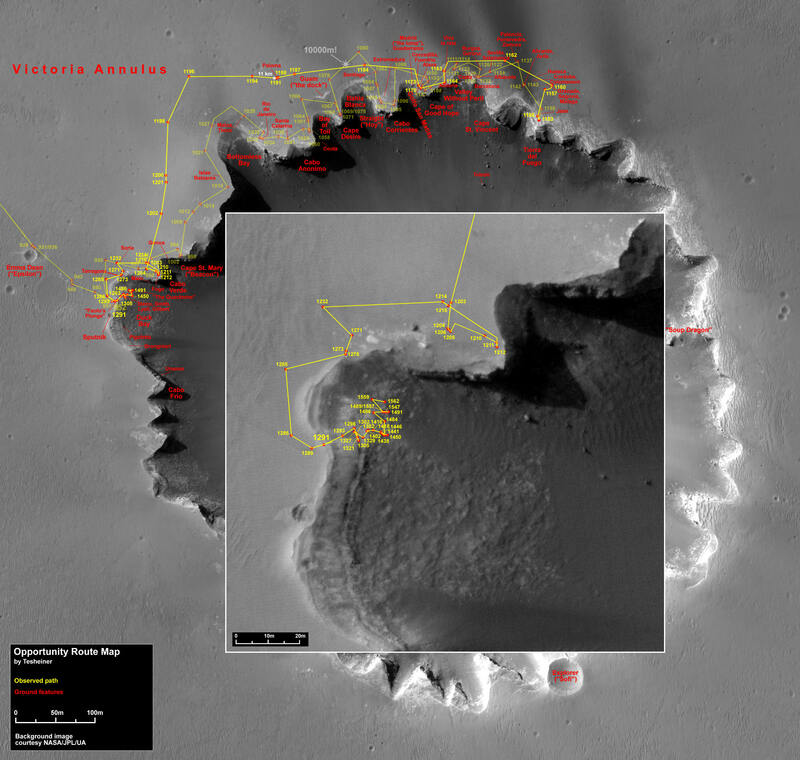 As of sol 1,562 (June 15, 2008), Opportunity was inside Victoria Crater, driving toward Cape Verde with arm outstretched. Again, I don't have enough time to thoroughly investigate the latest releases from the Mars orbiters, but I will direct you to the image pages for Mars Odyssey and Mars Reconnaissance Orbiter. I will note that there was recently a formal data release for Mars Reconnaissance Orbiter of thousands of new images -- lots of eye candy in there for people with spare time and high-bandwidth Internet connections! There hasn't been anything new from Mars Express since I last checked. At the Moon, Chang'e 1 and Kaguya are currently in orbit. The Kaguya mission finally released an English translation of their Apollo 15 landing site observations, which is pretty neat; I especially like this gorgeous perspective view on Hadley Rille from the Terrain Camera. 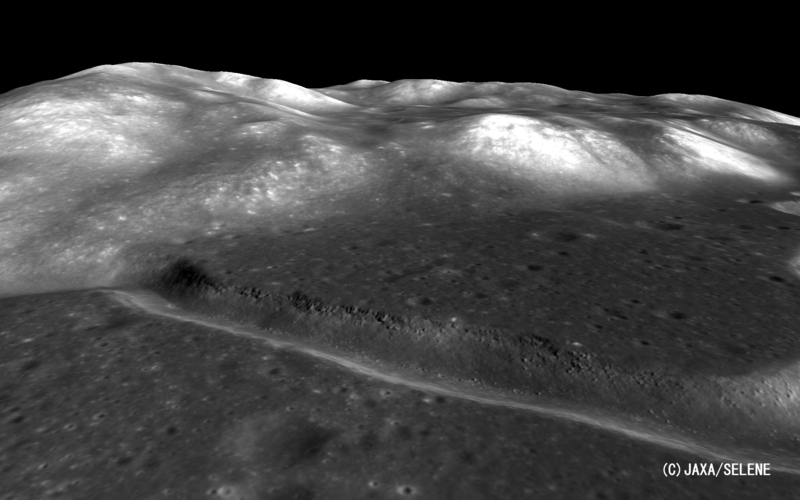 This perspective view on Hadley Rille, at the landing site of the Apollo 15 mission, was captured by the Kaguya orbiter's stereoscopic Terrain Camera, and clearly shows layering in the upper walls of the rille. At Venus, Venus Express is currently in orbit; there wasn't anything new released from them last week.MESSENGER is cruising toward its second encounter with Mercury on October 6, 111 days away. It is 123 million kilometers from Earth and 124 million kilometers from Mercury. They released another image taken within the Caloris basin last week, showing Cunningham crater. Out in space, New Horizons is 9.13AU from Earth and 21.40 AU from Pluto and, as of June 8, is flying beyond Saturn's orbit; it's surpassed Cassini to become the third-farthest operating spacecraft (the other two being the Voyagers). Voyager 1 and 2, Dawn, Deep Impact, Hayabusa, Rosetta, and Stardust are all in cruise mode, talking to Earth from time to time; Genesis is in hibernation. And, finally, ESA announced last week that the long-lived Ulysses mission will be coming to an end on July 1. There are a lot of features on this on ESA's website, including an interesting article with the gory details on why exactly Ulysses is failing now. Spacecraft are thought of as new, cutting-edge technology, which they are, but each has a unique design with unique problems, and when you throw age into the mix you can see how each one suffers from idiosyncratic aches and weaknesses. The men and women who guide these old spacecraft through their waning years come to identify with them and all their accumulated hurts and injuries, much as any sailor does with his ship or any farmer with her tractor. You nurse it, you figure out how to keep it working, you occasionally want to give it a good swift kick; even if you don't personify the spacecraft as a human, it does come to occupy the kind of space in your brain that makes it seem like a living entity. So it's sad to see an old ship like Ulysses go. But it's served its purpose, and done it well.